I have a Trade Account – can I still order Online? Yes, of course. We can replicate your trade terms Online. When you register Online for the first time, simply enter your Westburne account number (located in the top right hand corner of your invoice). When you shop Online thereafter, just login to see your trade terms. Can I apply for a WestburneTrade Account? You can apply for a Westburne Trade Account Online. Alternatively, you can contact your nearest branch for information on becoming a Westburne Trade customer. To find details on a local branch, please use our branch locator. I want to place an order – can I phone it through? Yes, simply call any of our branches. To find details on a branch local to you please use our branch locator. How do I create a Fast Order? Browse the catalogue either Online or a paper copy. Enter the item numbers of the products you wish to order into the Fast Order form (either manufacturer’s part number or Westburne product code). Click on 'Add to basket' to go to your basket and proceed to checkout. I’ve forgotten my password and/or username, what do I do? Don’t worry; we can email you a new one. Just enter your email address into the Forgot Username or Password link, and click on "Send". A new password will be randomly generated and emailed to you along with your matching username. The next time you login, you can change your password on your Profile page. If you are still experiencing problems please Contact Us. How do I get technical help with a product? If you are requiring technical help, please contact any of our branches, they will be happy to assist you. To find your local branch, please use our Branch Locator. Can I obtain a copy of my invoice/receipt? Invoices/Receipts will be posted out separately to your order, they will be sent to your billing address. If you require an additional copy please call a branch. Please click on ‘My Account’ from any page on the site, once logged in you can change your details under the ‘My Details’ tab. Click on ‘My Account’ from any page on the site. You are able to change your password once logged into your ‘My Details’ tab. If you wish to change your email address, this can be done in the ‘My Account’ area of the site under the ‘My Details’ tab. Once your email address has been changed you will receive a confirmation email to your new email address and your original email address. This is to protect your security in the event of fraudulent behaviour. What is a Job List? A Job List is a list of products you can create and save Online. A list could be a frequently ordered group of products that you often need or expect to re–order in the future, or a list of products you require for a particular job or project. How do I create or add a Job List? You can create Job Lists in a number of useful places across the site, such as from your current shopping basket, or from previous orders listed in your ‘order history’, ‘order details’ or ‘order confirmation’ page. You can also make a list by adding products to your basket as if you were creating an order. In the basket click ‘Save to Job List’ and give it a name you will be able to easily recognise it by. Another way to add an individual item to a Job List is from the product details page. When you select the ‘Add to Job List’ option on the product page, you can either select a current list to add to or create a new one. How do I order from a Job List? To view your Job List, click on ‘My Account’ from any page. Within ‘My Account’, click on the ‘My Job Lists’ tab to show all the lists you have created. You can add an entire Job List to your basket, or order selected items from a list. Then, either continue shopping or proceed to your basket and checkout in the normal way. After my order is placed will I get updates on its progress? Yes, we will email you when the status of any part of your order changes, keeping you fully informed of each item’s progress. Please note that your order may arrive as one or more consignments. All orders are followed by an email confirmation almost immediately. If you do not receive confirmation within 2 hours of placing your order, please contact Customer Service Contact Us. What is Westburne Online guided navigation? In the left hand column of your homepage, results are shown in product sections. Choose the section that contains the type of product you are looking for. From there, you can click to see only those products that have the features you require. You can narrow your search results further by selecting further features that are relevant to the product you are looking for. Using what is called the ’breadcrumb bar’, located at the top of the search results, you can see where you are in our product hierarchy. You can also use the breadcrumb bar to go back to any point by clicking on any section or product within it. Why can’t I find the product I’m looking for? Our website only holds a selection of the products we are able to source and supply, if something you are looking for doesn’t appear on our site, it doesn’t mean we are unable to locate the stock for you. If you are still experiencing problems, please call one of our branches. To locate a branch local to you, please use our branch locator. If you are planning a large project please contact one of our branches who will look at a competitive quote for you. Please use our branch locator to find a branch. Does Westburne recycle old electrical items? Westburne is professionally qualified and registered to help customers comply with the WEEE Regulations and has made a commitment to do so. Where do I take my recyclable items? Westburne offers customers a free–of–charge * recycling service for WEEE products and lamps at selected branches. Simply return your waste WEEE products and lamps to your local Rexel Atlantic branch, where we will organize their recycling and issue you will with all relevant statutory paperwork. To prevent harm to Westburne staff, please do not return any products that are inherently hazardous, such as damaged products with exposed parts or sharp edges. * A small charge may be made to cover the production of statutory paperwork, but no payment is required to recycle products covered by the WEEE Regulations. Westburne offers customers a free–of–charge uplift service for the recycling of lamps and tubes from their own site, subject to contract**. The range of container options includes bins, boxes, skips and pallets. Westburne will arrange for these containers to be installed on your site. Westburne offers a competitively priced direct recycling service for all general WEEE products. Simply purchase or rent your WEEE containers from Westburne. To ensure that our site is secure, we have enabled our sites to be secure with a SSL certificate. By default, most versions of Internet Explorer when mixed content is displayed a prompt window appears for the user to agree to show both content. 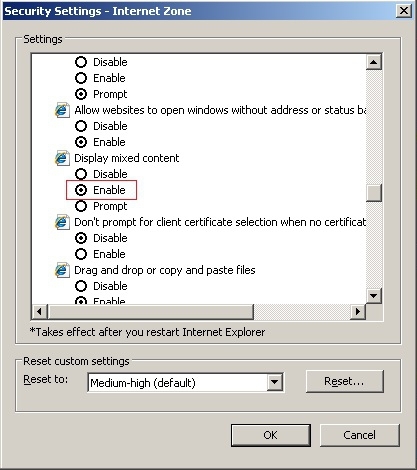 To disable this prompting and allow mixed content by default please perform the following steps in Internet Explorer. In Internet Explorer, go to Tools, Internet Options, click the Security tab; make sure that in "Select a zone..." window that Internet is selected. Click Custom Level and scroll down about half way to 'Display mixed content' in the 'Miscellaneous' section. Change it from 'Prompt' to 'Enable'. Click OK, Yes, and OK. The change should take effect immediately. If you continue to have issues, please contact your sales rep for assistance.